These are eloquent words. Words of justice and understanding. Words of reconciliation. They are the words of President George W. Bush – spoken at the Islamic Center of Washington, D.C. on September 17, 2001 – a mere 6 days after the Al Qaeda attacks that killed almost 3,000 in New York, Virginia and Pennsylvania. They are also the words of a President who said that Jesus Christ was the political philosopher who had influenced him the most. And, they are the words of a President who, using falsehoods on Iraqi WMD and links between Saddam Hussein and Al Qaeda as moral and legal justifications, would green light a military invasion and occupation of Iraq that would leave hundreds of thousands of civilians dead and an entire region destabilized. Fast-forward 14 years to the candidacies of Donald Trump and Ben Carson. Would either man utter the words uttered by Bush, let alone only days after the 9/11 attacks? Trump and Carson have made political hay by engaging in the kind of vitriolic Islamophobia usually reserved for the European far-right. Trump proved his credentials by not only refusing to correct a questioner who said that the US should get rid of Muslimsand that President Obama is a Muslim, but by actually answering the question as if it were legitimate. Ben Carson, on the other hand, took the more direct route by stating that aMuslim should not be President because the Muslim faith is inconsistent with the US Constitution. When challenged on his claim, and when it was pointed out that denying the right of a US citizen to become President on the basis of religious affiliation is itself a violation of the Constitution, Carson refused to back down. While it would be very easy to speak of a change to a more aggressive form of US Islamophobia, it would be more accurate to say that we are witnessing a change in how a long-standing anti-Muslim bias is expressed. Islamophobia is well-entrenched in the US, fuelled by a combination of popular culture, two-dimensional news coverage and foreign policy where Muslim lives are clearly valued less than others. Bush may have spoken some fine, scripted words about Muslims after 9/11, but it would be hard to imagine the initial levels of national support given for the invasion of Iraq had Bush pushed for invading, say, a predominantly white, Christian nation. Bush simply kept his rhetoric in check while letting US bombs do the talking. At the time, of course, Bush was considered a human gaffe machine. But now, in retrospect, he seems positively stoic. 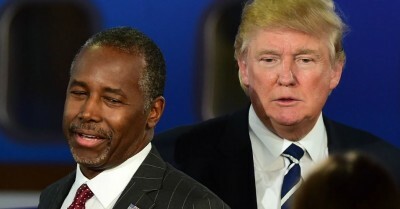 Trump and Carson are the new id of the US political right: not only unafraid to express what many in the US think (no matter how offensive or inaccurate), but they appear to revel in their own ignorance and the pain that ignorance generates. This is certainly the case in relation to Muslims and Islam, with Ben Carson tapping into the most ill-informed prejudices against the US Muslim community. And, even when they try to offer a modicum of decency, they reveal themselves. When Donald Trump was challenged on his perceived Islamophobia, for example, he offered the line: “I love the Muslims. I think they’re great people.” This is what Trump understands of racism and discrimination: they are mere PR glitches to be remedied with vacuous platitudes worthy of a late-night TV ad for one of his Atlantic City casinos. There are always glimmers of hope, but context matters. Collectively patting ourselves on the back because President Obama invited 14-year-old Ahmed Mohamed to the White House might feel good, but it doesn’t address the fact that the boy was detained and handcuffed in large part because of the anti-Muslim atmosphere generated by media, politicians and US foreign policy (for which Obama must take a fair degree of responsibility). This was (and is) an atmosphere decades in the making, and one that has been deadly. The failure of the US media in the lead-up to Iraq was not simply a failure to question the existence of imaginary WMD, it was a failure to make note of the chasm between Bush’s words on September 17, 2001 and his later actions. It was the failure to even approach the question of the extent to which the occupation and destruction of Iraq was made possible by the very Islamophobia Bush claimed was un-American. The questions we really needed to ask were about ourselves. That would have been real balance that questioned and disturbed, and not the fluffy faux-balance of pundit-driven TV. And that time has come again. But Trump and Carson now pose a dilemma for US journalists: what do you do within the near religious frameworks of “neutrality” and “balance” when candidates come out with blatantly Islamophobic positions? Yes, their opinions have been criticized, but criticism is not condemnation, and we should ask ourselves not only what we want from politics, but from our media. Is it really forced neutrality and balance, even in the face of vulgar bigotry? Is it media that infantilizes us by suggesting that the merits of even the blatantly idiotic and offensive are worthy of debate and analysis? Or, do we want deeper introspection about our politics and our society, and a more painful-but-beneficial discussion? Just as we gazed into the abyss a decade ago, so we gaze into it today. Let’s cover that story before it’s too late.